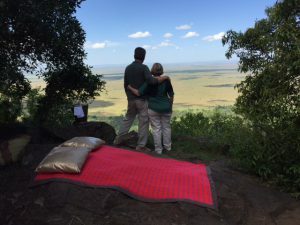 Susan recently headed off to check out four camps in Kenya and a hotel in Zanzibar, and all five were magical. Here’s her report. 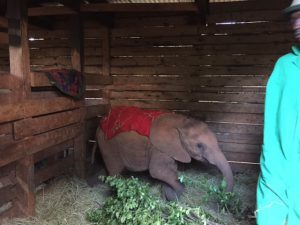 After arriving at the airport, we headed straight for the elephant orphanage at David Sheldrick Wildlife Trust; many people find it’s one of the highlights of their trip and we thoroughly recommend a visit. If you adopt an elephant, you can go for a special visit at 5pm (everyone else goes at 11am) and it’s so exciting to see all the ellies come running back from the bush to their handlers as they know they are going to get their bottle of milk. Our adopted elephant, Kiasa, who is one years old. We chatted with one of the handlers – who knew every ellie by name – and asked him how you get a job like his, and he replied that an essential part of the recruitment process is that the elephants have to like you! (Having said that, handlers are rotated regularly so that the babies don’t get overly attached.) The whole experience was completely heart-warming, and I thoroughly recommend reading the late Daphne Sheldrick’s memoir, An African Love Story: Life, Love and Elephants for the backstory of how the orphanage came about; it also gives valuable insight into conservation in Kenya as a whole. I stopped in to see Giraffe Manor, and I heard later that Ellen DeGeneres and Portia de Rossi were staying there at the time but I didn’t get to see them! I was not there at a mealtime and did not see the giraffe come up to the windows, but could imagine how guests would enjoy these special moments! We stayed overnight at Hemingways, a boutique property with magnificent views over the Ngong Hills, where Karen Blixen had her farm in Africa. We’ve started recommending this property to clients a lot and I could see why first-hand: it’s a gorgeous property with spacious, light-filled rooms, and if you’re staying longer there’s a large swimming pool and spa. We had a great dinner, but our stay was brief – we were up and off to the Mara the following morning. We flew to Angama Mara, and the only word to describe this property is spectacular. Not only for the location – on a ridge overlooking the Mara – but also for atmosphere. The camp is owner-run by Nicky Fitzgerald and her daughter Kate, and it was clear all the staff adore her and all work really well together as a team. There was a real sense that nothing was too much trouble, and whatever you may want, they’d make happen – you’ll see why I say this a little further on! There are two camps of 15 tented suites, each camp has its own public areas. The tented suites are contemporary in style, with floor-to-ceiling glass fronts to make the most of the breath-taking views. Every detail had been considered, from sufficient lighting to read a book to having a handy dustbin in the room – I pay attention to the smaller things, and they got everything right. I was taken on a back-of-house tour, and it was fascinating – I highly recommend this if you have the chance. We were shown the laundry and met the man who runs it, who was really proud of his work, and also visited the bountiful shamba, or vegetable garden. 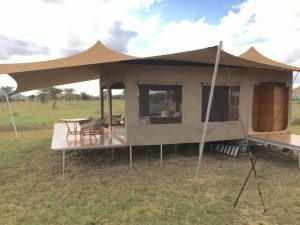 The camp also runs a clinic for the local community, which is a big plus in our books – our preference is to work with camps who give back to the local community, and Angama Mara more than fits the bill in this regard. We also toured the staff quarters – each staff quarter has their own courtyard and the camp runs a competition to see who can create the best garden in their courtyard, which is really a great idea and creates a sense of pride. 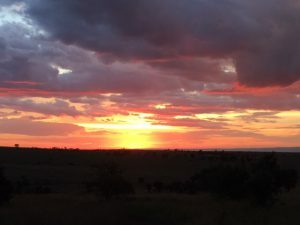 We went on several game drives and they were all excellent, even though the grass was very high – the Mara had had more rain than usual and the wildebeest hadn’t come through yet – and some roads were waterlogged. The camp actually has its own private access road into the Mara which is very handy for quick access into the park. They also have their own airstrip which is not too far from the camp. It turned out that they filmed the movie Out of Africa here, as the Ngong Hills were too developed, and we were lucky enough to have our very own Out of Africa moment too. It was my husband’s idea and the staff made it happen, even providing a guard to protect us from any roving wild animals. It was a bit of a hike to get there, but we arrived to find a blanket, cushions and champagne ready for us. My husband had bought a ring from the curio shop and got on one knee to propose again! It was a magical moment! Our Out of Africa moment! 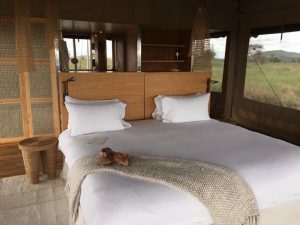 A lot of our clients stay at Sand River Mara, and it’s completely different to Angama Mara. It’s smaller, for a start, with more of a colonial feel, and the food particularly is outstanding. We had a fantastic guide, and our game drive included a ‘bush breakfast’, where we drove up onto a rock so we could eat on the top with a great view. The day before we had seen a pride of lions with several cubs lazing on the rock! The managers here were new but have worked in other camps we know well in Tanzania and I think they’ll be a really good fit for this camp. At the moment they are rebuilding their outdoor showers and also moving the pool to a sunnier spot. Then to the Serengeti and Lamai Serengeti Camp, which again was completely different! The rooms are made of a mix of plaster and canvas with thatch roofs, and they are really spacious with huge bathrooms. The public areas are really lovely too, with little nooks you can escape to with a book if you’d like to be on your own for a bit. Dinners are eaten all together, and hosted by the camp manager, and we had excellent dinners chatting with other guests. The camp also has a private house, MKombe House, about 15 minutes away which has four bedrooms and two swimming pools, one for kids, one for adults – if you’re traveling as a group or family, this is a great option. When the migration passes through, it’ll take place right in front of you. There is also a fun option to do a sleep-out on the deck. The migration hadn’t reached this area yet but wasn’t too far away. After another bush breakfast, just for the two of us, we drove for 1.5 hours to the Moru Kopjes and saw the start of the herds – which was amazing! We saw them on the move, too – wildebeest and zebra that just kept on coming and coming. We then flew to Kilindi in Zanzibar. It’s popular with honeymooners and it isn’t hard to see why; there’s a beach in front of the property for long walks but there’s also lovely pool to laze beside. 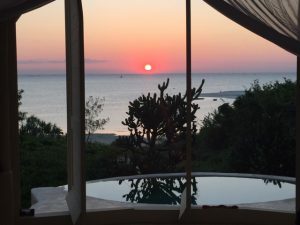 The rooms were pretty special – as you walk in there’s a courtyard with a daybed and plunge pool, and then you walk up some stairs, and on one side is your bedroom, on the other side the bathroom, which is open-sided and has a shower from which you can watch the sun set over the ocean. At the end of the bedroom are some doors, which you can open to reveal another plunge pool. Some rooms have a terrace instead of a second pool, and there’s also the infinity pool in the hotel garden. The atmosphere is very relaxed; you can eat when you want and where you want – the staff like to surprise you each time with the setting, even for breakfast – it’s always a different place. The chef is a Zimbabwean guy who is very passionate about what he creates, and he’ll come to you to chat about your preferences and the specials for the day. You can paddle board, kayak, scuba dive, snorkel… you can do as little or as much as you like, but ultimately, it’s wonderful for a bit of R&R after a week or so of early rising on safari.